Key Milestones / Learning to walk: Your FAQ answered! Your baby will achieve tons of milestones, but his first steps will definitely be one you won’t forget! 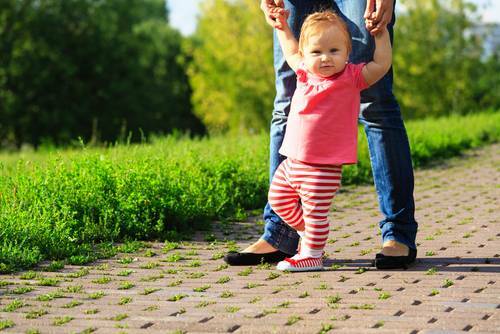 Walking is a mayor achievement in your baby’s physical development and, if you are like most parents, you may have questions about the subject and how you can encourage this milestone. Generally babies take their first steps between 9 and 15 months, but remember that babies develop at their own pace. So be patient if your little one is taking his time; some babies start walking later on, at around 18 months, and it’s fine! Did you know that babies are born with an innate knowledge of the movements needed to walk? They just lack the strength in their legs to do it. If you hold your baby in an upright position you will notice he instinctually moves one foot in front of the other in a walking-like motion. This is called the stepping reflex, which disappears when babies are 4 months old. How can I know if my baby is ready to walk? By 7 and 10 months, most babies learn to crawl (although some babies never crawl before walking). By 9 and 12 months, babies learn to stand up by themselves. Just remember, your son may be using some furniture as support, so make sure to baby-proof your home! Once your baby masters how to cruise between furniture he will venture to practice his first steps by himself. As your baby starts to take his first steps, you will feel tons of joy seeing your little one starting to gain his independence, but you’ll probably feel anxious too as you see how every object can become a hazard! You probably baby-proofed your home when your little one was learning to crawl. Now you need to keep in mind that your baby will be able to reach higher objects, so just make sure to check again. The most effective way to ensure your baby’s safety is to take a baby’s-eye view of your home. Get down on your knees and see how things look from down there. This will help you figure out which cupboards, drawers, and other spaces your child might try to reach. How can I help my baby take his first steps? Walking is all about confidence and balance. The best way to help your little one is by praising and encouraging him every time he tries to walk. His first steps will mean a lot to him, so when he reaches this monumental milestone, make sure to make a big deal about it. You can find tons of activities in Kinedu to encourage and practice this skill! Remember, practice makes perfect; the more he practices, the better he will become. Before you know it, he will almost be running around! Did you know that babies are born with an innate knowledge of the movements needed to walk? They just lack the strength in their legs to do it. Why is curiosity so important and how can we encourage it?